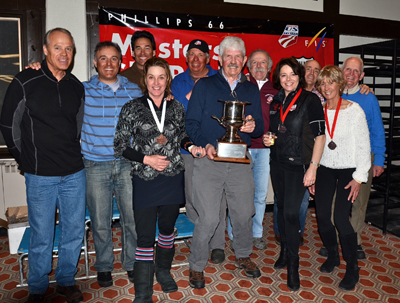 It was a long and grueling week for Sun Valley and Park City (Utah) Master alpine ski racers as they traveled back east for the USSA Phillips 66 Masters National Championships held March 16-22 at Okemo Ski Resort in Vermont. Some 214 ski racers, 169 men and 45 women, came from all over the nation to compete in the event that determines the best ski racers in the nation. Sun Valley and Park City helped make up the Intermountain Division team. And the grit and determination shown by the Intermountain Masters resulted in the winning of the National Championship Division Cup, a feat not since accomplished by Intermountain since 2008. The Division’s Cup was given to the division with the best ratio of points scored per competitor start in national championship races. Intermountain’s 12 competitors had 1.75 points per start, compared to 1.603 for Eastern Division’s larger group of 175 skiers. Jan Swift (Class 10) and Amy Lanzel (Class 7) were the Intermountain racers named to the 2015 Spyder National Masters Team chosen from the top age class finishers from the giant slalom/slalom at nationals. The super giant slalom races were canceled this year. Downhill: Steve Slivinski (Class 10) placed sixth, Bill Skinner (Class 7) fifth and Lou Mauro (Class 4) third. Giant slalom, men: Drury Cooper (Class 12) third place podium, Slivinski 12th place, Dave Brennan sixth, Kevin O’Connor 15th, Mike Robbins third, Lynn Vaughn 15th, Jeff DeLong 19th, Lou Mauro sixth. Giant slalom, women: Jan Swift won with a five-second lead followed by Amy Lanzel’s stunning second run comeback to capture the silver medal. Heidi Flood helped secure the division cup win with a bronze medal finish. Slalom, women: Silver medals for Swift and Lanzel, the bronze for Flood, as the three Intermountain contenders carried the weight and secured championship medals. Slalom, men: Drury Cooper just missed the podium with a fourth, Steve Slivinski ninth, Dave Brennan fourth, Kevin O’Connor 11th and Mike Robbins won the gold in one of the toughest classes.